At the Tabard Inn in Southwark, a jovial group of pilgrims assembles, including an unscrupulous Pardoner, a noble-minded Knight, a ribald Miller, the lusty Wife of Bath, and Chaucer himself. As they set out on their journey towards the shrine of Thomas a Becket in Canterbury, each character agrees to tell a tale. 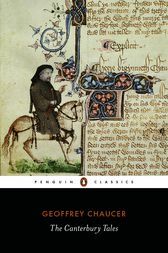 The twenty-four tales that follow are by turns learned, fantastic, pious, melancholy and lewd, and together offer an unrivalled glimpse into the mind and spirit of medieval England. Born in London to a wine merchant, Geoffrey Chaucer (c1340-1400) became a royal servant and travelled as a diplomat to France, Spain and Italy. As well as being famed for his translations, his own work includes Troilus and Criseyde, The Book of the Duchess and The Legend of Good Women. Jill Mann has been Professor Medieval & Renaissance English at Cambridge University, and most recently Notre Dame Professor of English. She is the author Feminizing Chaucer (2002), and co-editor (with Piero Boitani) of The Cambridge Companion to Chaucer (2nd edn. 2003). Jill Mann has been Professor Medieval & Renaissance English at Cambridge University, and most recently she was Notre Dame Professor of English. She is the author Feminizing Chaucer (2002), and co-editor (with Piero Boitani) of The Cambridge Companion to Chaucer (2nd edn. 2003).